"NY Is Burning" is the long awaited Mixtape/Street Album from one of the hottest new Production Teams in the game. "NY Is Burning" features all original songs and remixes from Mos Def, Collie Buddz, Young Buck, Sizzla, Dead Prez, Damian Marley, Outlawz, and much more… All over original Production from Beatnick & K-Salaam. 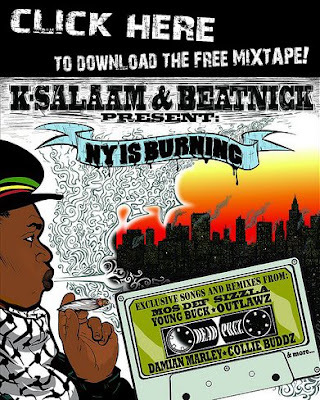 "NY Is Burning" should give you a taste of what K-Salaam & Beatnick are capable of. The official album -> "Whose World Is This?" will be in stores everywhere on July 29th, 2008 on VP Records, with dist. through Universal.